Grant A. Jones is a fourth-generation member of the Knights of Peter Claver, Inc. initiated into Paul Ladnier Jr. Branch #4 in 1976, and he is currently a member of Saints Peter and Paul Council #313 and the Archbishop James P. Lyke Fourth Degree Assembly #43. 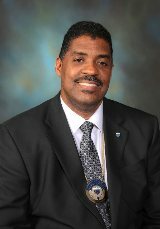 Mr. Jones served on the National Council Board of Directors of The Knights of Peter Claver, Inc. from 2010-2013 as Gulf Coast District Deputy, Director of Conventions, and Chair of the Personnel Committee. In September of 2013 he was selected as the Orders Executive Director, and was appointed to also serve as the Executive Director of the organization’s charitable division, the Saint Peter Claver Foundation in January of 2015. Mr. Jones attended Southern University at New Orleans, and spent over 28 years as hotel and restaurant executive having served at some of the nation's largest hotel and restaurant corporations. E. Desmond Taylor is a native of Houston, Texas. He currently attends Howard University where he plans to obtain a B.A. in Legal Communications with a minor in Political Science in May of 2016. He is a member of the Freshmen Leadership Academy, Gentlemen of Drew Social Club, Inc., the Executive President of the School of Communications, and Keeper of the Records of the Howard University Chapter, the Xi of Kappa Alpha Psi, Inc.
Mr. Taylor is a member of St. Mary of the Purification, Council #159 in Houston, Texas. He has served the Knights of Peter Claver, Inc. in several capacities since June 2002. As a Junior Knight, E. Desmond Taylor was elected to the positions of Junior National Secretary (2005-2007) and Junior Supreme Knight (2007-2011), where he was the youngest and longest serving Junior Supreme Knight at that time. After transferring to the senior division, E. Desmond Taylor was elected as Texas State Conference Recording Secretary (2012-2014). In addition, he served as Junior National Board Advisor (2013) and appointed by Supreme Knight, F. DeKarlos Blackmon as National Convention Parliamentarian (2012, 2014). While at Howard University, Desmond had the unique opportunity to travel abroad to China on a cultural immersion trip from July to August 2013 with the Howard University Freshman Leadership Academy. During that time, he traveled to Beijing and Shanghai while participating in strenuous Mandarin courses, community service, scenic tours and one-week government affairs internship. Moreover, Desmond had the privilege of interning in the office of U.S. Representative Marc A. Veasey of Fort Worth-Dallas, Texas (33rd Congressional District) in partnership with the Congressional Black Caucus Foundation during the summer of 2014.